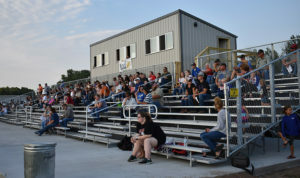 The Crowd enjoys the football game as they sit on the newly constructed bleachers. We have built a new press box/concession stand on the east side of the football field in Forestburg. It has three separate rooms on the top level where coaches and different press personnel will have space to work and cover Blackhawk Football. On the lower level, we have built a new concession stand to make it easier for fans to grab a bite to eat without missing any action. The remaining portion of the lower level is for storage at the moment. However, that portion will be finished with bathrooms in the future stage of the project. 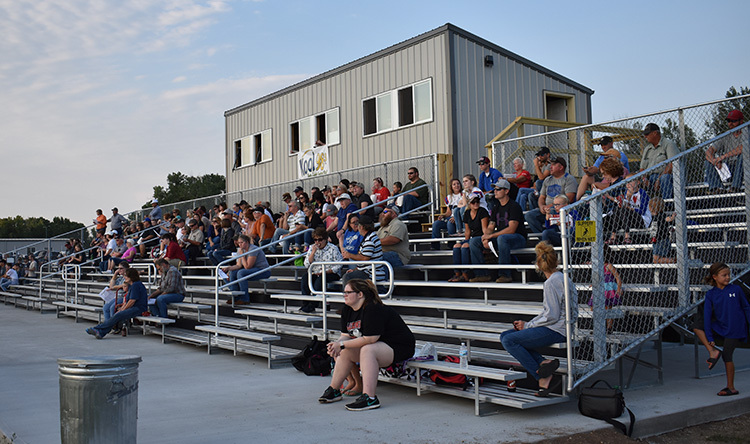 The space has also been upgraded with a 500-seat bleacher system for spectators to sit while watching the activities, should they choose to do so. The Sanborn Central Booster Club has been very instrumental in assisting the project through their generous contributions and continued fund-raising efforts. The goal of the project was to ensure that football games were still played in Forestburg, and that those in attendance would have a great experience. Also, the upgrades will provide an improved experience for our youth soccer program that takes place in the spring. We are still in the planning stages of additional storage options within the campus so that materials that are not currently in use will have an appropriate place to be stored to maintain their usability. As with all large scale projects, patience is necessary to ensure that everything is completed the way it is intended to be. There is still work to be done to complete this project, but just like the rest of our campus, the end product will be something that our communities can be proud of. We hope to see all interested community members at the field this year! …See more pictures in this week’s issue of the Sanborn Weekly Journal!